The first presidential debate certainly didn't disappoint those who were anticipating major tension between Donald Trump and Hillary Clinton. And although there was a bevy of intense moments, one of the more heated ones occurred when Clinton confronted Trump for allegedly calling former Miss Universe Alicia Machado "Miss Piggy" and "Miss Housekeeping." 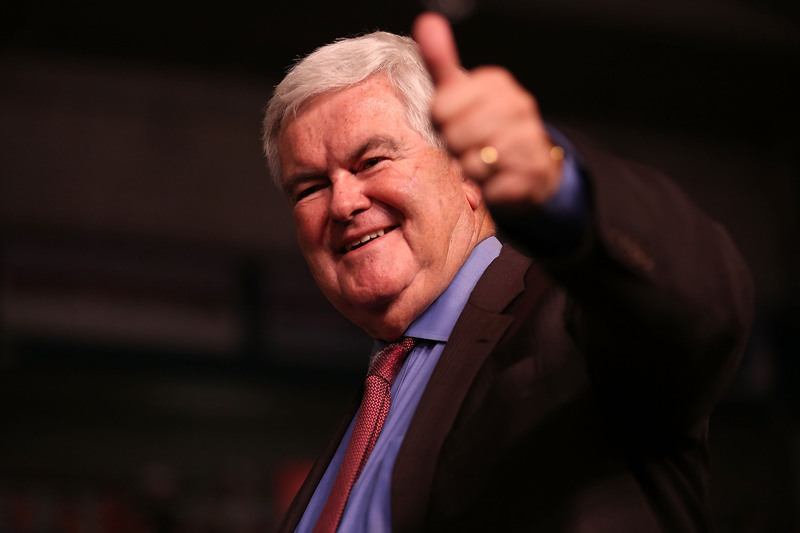 Following the debate, former speaker of the House and 2012 GOP presidential candidate Newt Gingrich defended Trump's fat-shaming, and the move will in all likelihood only make the situation worse for the Republican candidate. “Donald, she has a name. Her name is Alicia Machado,” Clinton said at the debate. “And she has become a U.S. citizen and you can bet she is going to vote this November." Trump appeared on Fox & Friends the day following the debate and defended the alleged comment by saying the former Miss Universe “gained a massive amount of weight and it was a real problem.” Then, Gingrich dug an even deeper hole for the presidential candidate. "You’re not supposed to gain 60 pounds during the year that you’re Miss Universe,” Gingrich said at a Washington dinner with the Log Cabin Republicans, a group that works with LGBT conservatives. He then seemed to imply that his comment would be unfairly construed as a "sexist" statement. “Not fair. Even my act of saying that is sexist and proves I’m not being sensitive,” he said. That brought about some swift reactions, to say the least. And a handful of people decided to play hardball by pointing out that Gingrich isn't exactly svelte. One has to wonder why Gingrich, who has been relatively quiet of late except for a brief moment when he hinted that he might consider a speaker run, would step into the limelight to defend Trump on such an irredeemable offense. Forget about tackling issues related to global warming, economic plans, or foreign policy. Gingrich chose to focus on something that should never have been a topic in the first place — the weight and appearance of a former Miss Universe. Nah, that's not sexist at all. And it only confirmed the claims Clinton made during the first presidential debate. It's unfortunately hard to decide which is less "presidential" seeming: claiming that Rosie O'Donnell, a well-known comedian and TV personality, "totally deserves" being attacked for her appearance, or defending some pretty nasty, body-shaming attacks made on a former Miss Universe.